When we launch phone numbers at Twilio we want to make sure we are providing customers with the high quality product they expect from us in each and every geography. For this reason we roll out new phone numbers carefully. We start with extensive testing internally and then enter a Developer Preview phase to monitor real-world usage in each country to ensure these numbers meet our standards. Once this has been completed we launch the numbers in public beta and offer them to all Twilio customers. The global telephony ecosystem is very complex and sometimes only large volumes of traffic can uncover issues that may exist. 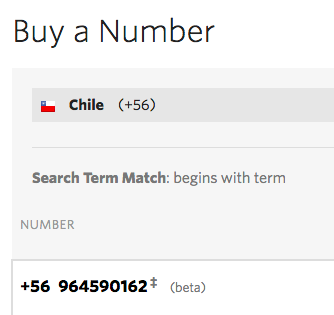 We let customers know which numbers are newest on our platform by marking them as ‘beta’ within the Buy a Number section (see the screenshot below) and REST API. From time to time there may be connectivity issues with a local carrier so we make sure to monitor our beta numbers very closely and quickly work to resolve any issues that come up. Once we have received a significant amount of traffic on the new phone numbers, we will remove their ‘beta’ designation. Generally this happens around three months after they’ve been added to our beta inventory. There are no changes made to the beta number at this point, it simply means they’ve passed our final quality standards.